UltraBac Software, author of award-winning backup and storage management software, is proud to announce enhanced support for Microsoft Cluster Server. The company's software has supported cluster servers since 1999 with its version 5 release, and continues to do so today with its most recent version 8. UltraBac fully supports all Windows 2000/2003 environments. While clustered environments are designed to provide high availability to users who buy this technology, a strong disaster recovery plan is still required because a node can fail. This leaves the cluster vulnerable to a total failure until the failed node has been restored to 100% operational status — this is particularly true in a two node cluster. Therefore, a comprehensive disaster recovery plan must not only include a quick recovery of the node and its data, but should also require saving multiple backup copies that are rotated and saved off-site. UltraBac Software's UltraBac Disaster Recovery (UBDR) Gold product has been designed to quickly and easily restore a failed node to 100 percent operational status after suffering a catastrophic or unbootable server failure. Microsoft Cluster Server 2003 customers (and many others) require the highest availability possible for their critical servers and applications. Due to this requirement, image based disaster recovery software, like UBDR Gold, is the corner stone of any comprehensive disaster recovery plan. Because until a machine can be restored to 100 percent operational status, any further required disaster recovery operation is at a complete standstill. Using cutting edge "snapshot" technology, UBDR Gold backs up the file system within a partition, disk, or all disks connected to a machine. All open files are backed up, including relational databases that might be operating split over multiple partitions or disks. Being able to safely and concurrently "lock" all open files during the snapshot process guaranties the integrity of every backup. In turn, this equates to being able to securely restore any required partition with the assurance that all of its files and databases have been absolutely preserved. For cluster server users, this includes the operating system partition, the cluster quorum database partition, and any other data or shared drives that might be active on a node at the time of backup. Figure 1: The following diagram shows a basic server cluster configuration. 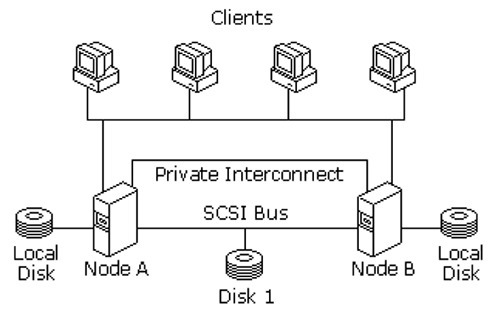 Each server node has a local disk which can contain information specific to the node. In the event of an unbootable failure, a recovery can be initiated by a quick boot off the WinPE based UBDR CD. There is no need to install a temporary operating system (OS) as with a traditional file based recovery. An operator only needs to follow the simple steps provided by the restore wizard to recover a failed node's OS partition to the last point-in-time snapshot (image backup). Then, if needed, an operator can restore any other partition(s) on any other virtual network names. For cluster server users, a disaster recovery operation properly restores all the cluster node information captured during the image backup. Therefore, a recovery specifically includes restoring a node's Disk Signatures, GUIDs, and SIDs to ensure that a recovered clustered machine boots successfully with no errors. UltraBac was the first commercial software product to introduce image backup with flexible options. This included the ability to back up any network resource that Windows could connect to via a UNC share path. Furthermore, UltraBac Software was also the first company to conclusively prove that a third party backup program could successfully back up and restore an active, online Windows Cluster Server configured with multiple nodes. In this test, the backed up cluster node was actively running SQL Server. The recovery trial was set up and monitored by Microsoft personnel at their Partner Solution Center on Microsoft's main campus located in Redmond, Washington. UltraBac was installed on a networked server, and performed a backup of one of the two active cluster nodes to a stand alone tape drive. Options for backup other than local tape include: local disk, remote disk, remote tape, local libraries, remote libraries, SAN/NAS devices, TSM servers, FTP devices, CD/DVD writers, optical, and networked UNC paths. Image backups can also be written to any hardware based RAID device (including RAID 5). After erasing the test cluster node's OS partition using FDISK, UBDR was used to boot the failed cluster and rapidly restored the server, without any complications, in approximately eight minutes. The restore included a 100% retrieval of the failed cluster node's registry. Upon recovery, the failed cluster node was re-synchronized successfully to resume 100% cluster operation. No intermediary software or steps were required – just basically boot, restore and reboot. UltraBac Software customers have reported speeds from 1-3GB/minute when performing network and local tape restores. Network restore performance is highly dependent on connection speed, network traffic, and machine configuration. 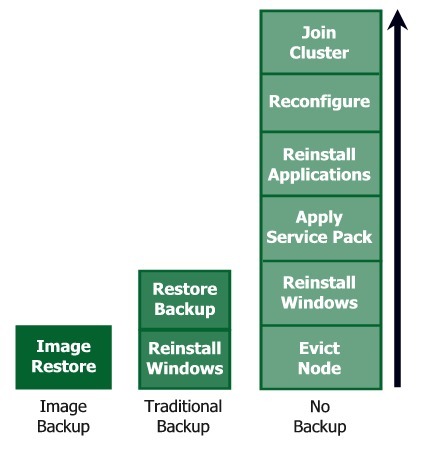 Figure 2: Steps to recover a single cluster node. Since UltraBac's debut as the first commercial backup application to successfully back up and restore an active Microsoft Cluster Server, support has been continually added for every new server operating system since NT 4.0. With Windows 2003, users now have the choice of using either Microsoft's Volume Shadow Copy Service (VSS) or UltraBac Software's built-in Locked File Backup (LFB) Agent for selected partition(s) or full disk backups. Microsoft’s VSS does not currently support incremental or differential image backups for Windows 2003 so, when these types of backups are required, the software automatically uses UltraBac’s built-in LFB Agent to safely back up all open files. For file based and image backups, UltraBac can freeze all open files on a single disk, or on all disks physically connected to a machine. This eliminates any requirement to boot a machine into a "safe-mode" for backup as do some competitive products on the market. Literally just point and click for a perfect snapshot on an active 24x7 machine at any time. With UltraBac, an average 8GB OS partition is backed up on a typical 100BaseT network connection at approximately 1GB/minute. Gigabit connections offer backup speeds of up to 3GB/minute when run during a period of low network activity. Today, UltraBac customers have many powerful new features including two WinPE CD based versions of UBDR. Using WinPE provides customers with a "universal" boot CD that comes pre-installed with every current device driver required to boot any Wintel machine. When booting from the CD, drivers are automatically installed for every required NIC, SCSI, and/or RAID controller – the days of having to create special pre-configuring boot media for each machine, or unique hardware configuration, are long gone! The Windows based wizard then guides the user through a complete recovery in a matter of minutes. UltraBac Software now provides the GUI based versions of UBDR Pro and UBDR Gold as opposed to the text based DOS version used at the 1999 Microsoft test. UBDR Gold offers all the functionality of Pro, but adds the newly released support for true dissimilar hardware restore, virtual integration to both VMware ESX/GSX and Microsoft Virtual Server 2005, physical-to-virtual (P2V) restore, virtual-to-virtual (V2V) restore, and virtual-to-physical (V2P) restore. Gold also offers the ability to cold boot an image backup, cold boot a file based backup, cold boot a file based restore, and perform 100% scripted restores for no user intervention. UBDR Gold also offers optional cost agents for local and remote autoloader support, TSM support, and FTP support. Basic UBDR Pro functionality includes smart image technology whereby the default option is to only back up actively marked in-use disk clusters. Furthermore, large files on OS partitions, like temporary page files and hibernation files, are automatically skipped because they cannot be re-used after a restore, and therefore would be a waste of both time and space to back up. The disk blocks that are backed up are automatically compressed before being written to the backup target location. The idea behind "smart" image technology is to back up only the absolute minimum necessary during a block level backup of a partition or disk. UBDR provides a built-in encryption option with up to 128-bit data protection. When invoked during a backup, each block is encrypted during the process of reading the data for writing to the backup device. This means that whether the backup "pushes" or "pulls" the images across a network, they are guaranteed to be 100% secure. Image backup and restores can provide performance speed at or near manufacturer device rates because the technology bypasses the OS and does direct reads and writes to disk. While this allows backups to run faster on an active system, it significantly increases disaster recovery restore speeds because UBDR does not have to negotiate with an active OS partition during a recovery. Administrators can optionally enable UltraBac's Single File Restore (SFR) for backups. With SFR enabled, each backup automatically creates an additional index which allows individual files and/or folders to be restored from a saved image backup. Customers performing image backups to online network locations also have the option to use UltraCopy. UltraCopy is an optional utility that provides the ability to copy or move online disk backups to tape. Clients performing multiple concurrent "push" image backups can use UltraCopy to copy, or move, all separate backups to tape with a consolidated index written to the media. For example, UltraCopy could be used if a client had 30 licensed copies of stand alone UBDR installed on its network servers that were individually scheduled to back up to a central RAID5 storage device. Using UltraCopy, they would script a disk-to-tape backup of all 30 disk backups to a tape drive with a new and comprehensive index written to the media, enabling direct retrievals from each UltraCopy created tape. Tape-to-tape copying is also supported. UltraCopy essentially provides a two stage disk-to-disk-to-tape operation (autoloaders not currently supported). UBDR Pro and Gold support basic disk with both primary and extended (logical) partitions, EISA partitions, Dynamic disks (both simple and mirrored volumes), and Basic and Dynamic GPT disks. Both products are also available in true 64-bit versions. They natively support both Intel Itanium 64-bit and AMD x64 processors. Users of bare metal disaster recovery software all have a common profile regardless of their business orientation or size. All Windows based machines have an innate liability for loss of productivity due to unbootable failures. This is because Windows only supports one bootable operating system partition. While downtime from hardware failures can be minimized by implementation of RAID, disk mirroring, Cluster Servers, continuous data protection, and file based backup software, none of these solutions provide the ability to quickly and painlessly recover a failed machine that cannot be booted. Statistics indicate that approximately 65% of unbootable failures are software based. This means a corrupted registry, a bad device driver, a deleted file, a virus, a Trojan, or perhaps some other problem accidentally caused by an operator was the root cause of the failure. The problem with every other protection scheme is that none of them provide the ability to quickly restore a failed machine's operating system! Consider mirroring or CDP, both simply copy corruption, virus, or any other "soft" problem. Using normal Windows recovery techniques, restoring an unbootable machine takes anywhere from a couple of hours to a couple of days. With the cost of downtime ranging from $5,000 an hour for modest servers to easily over $100,000 an hour for critical servers, it does not take a mathematician to calculate that restoring a failed server in 10-30 minutes is going to save an organization money. It might even save the business from a total financial catastrophe. Customers of UltraBac Software's UBDR Pro and Gold include some of the world's largest corporations and government entities. These organizations are using thousands of licenses to protect every server in their network. Other customers include many of the world's smallest companies and organizations. A common denominator among these different sized organizations are that often they have limited or no technical staff. UBDR is basically disaster recovery insurance that offers customers a means to recover a failed server quickly and easily, even when no technical staff is available. Recoveries can be fully scripted for totally automated restores, and can even be performed remotely on PXE enabled machines. With UltraBac Software, customers have the widest range of backup and disaster recovery options available in the Windows market. Whether a customer wants to use UBDR on a stand alone server, or requires a full backup and disaster recovery solution that integrates both file and image backups into a single job, UltraBac offers the flexibility of either role in your disaster recovery plan. Customers with existing backup solutions in place can easily integrate UBDR's bare metal disaster functionality to further enhance and add to their disaster recovery preparedness. UBDR's coexistence capability is especially appreciated by larger scale enterprise customers who have found that UBDR runs without conflict with existing applications. The foundation for every disaster recovery plan should be the implementation of a bare metal disaster recovery product like UltraBac Software's UBDR Pro and Gold. Bare metal disaster recovery should be the primary recovery tool in any data protection plan for critical Wintel machines, including Microsoft Cluster Servers (since a two cluster node is extremely vulnerable after one node fails). UltraBac bare metal disaster recovery software was designed for users who consider their servers to be mission critical and require the highest availability possible. UBDR is easy to operate and deploy within any size network. The built-in scheduler and "locked open file" backup technology allows organizations (from the smallest of businesses to huge data centers) that rely on Windows to automate their backup jobs, and image live production machines quickly, and without conflict. Once installed and operational, UBDR provides customers a fast and painless means of restoring a failed machine to full operational status. In summary, UBDR Gold allows the recovery of a failed operating system partition, on an unbootable machine, in a fraction of the time it normally takes to do the same using traditional recovery methods. This saves not only a considerable amount of time and effort, but also a lot of money whether the recovery is performed on a Microsoft Small Business Server or a powerful four-node cluster server. Few applications offer a 100 percent return on investment from a single use as does UltraBac Software’s UBDR Gold image based disaster recovery. © Copyright 2006 UltraBac Software. All rights reserved. UltraBac Software, UltraBac, UBDR Pro, UBDR Gold, UltraBac Software logo, and Backup and Disaster Recovery for Business are trademarks of UltraBac Software. Other product names mentioned herein may be trademarked and are property of their respective companies.